We are the first manufacturer to have developed an occupancy sensor with "Tunable White Function". The detector regulates the colour temperature of the white tone in the room to provide the most beneficial influence on people’s biorhythms. 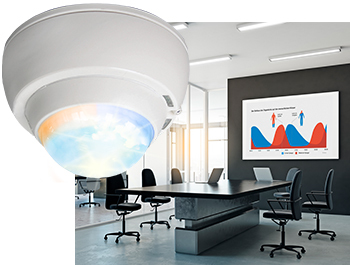 The CONNECT-P-HCL is the new DALI occupancy detector with "Tunable White" function for Human Centric Lighting (HCL). Like other DALI occupancy detectors, this detector regulates different lighting groups according to daylight and occupancy, to increase convenience and energy efficiency. A new feature is that the detector can also control the colour temperature in the room if DALI lights with "Tunable White Function" (Device Type 8) are connected. Preset application profiles can be selected according to the room’s current usage. These profiles control the colour temperature and light level in the room as the day progresses. The change in the colour temperature from warm white to cool white and the change in light level conform to human biorhythms. This takes place very slowly, and is hardly apparent to the user. This kind of biodynamic light is proven to increase wellbeing and has positive effects on health. There are numerous applications for biodynamic lighting control in offices and industry. The introduction of this technology into schools and healthcare institutions also achieves positive effects. Biodynamic light is especially good in retirement homes, where it can help regulate the human body clock and significantly improve the quality of sleep.